Explosive, Unrated Extended Edition with exclusive footage and more action! On the eve of a devastating Cylon attack, officer Kendra Shaw reports for duty on the battlestar Pegasus. When mankind's future is forever changed on that fateful day, Kendra is reshaped into a "razor"—a tool of war—under the ruthless guidance of her commander, Admiral Cain. Battlestar Galactica: Razor tells the untold story of Pegasus and provides chilling clues to the fate of humanity as the final chapters of the Battlestar Galactica story unfold. 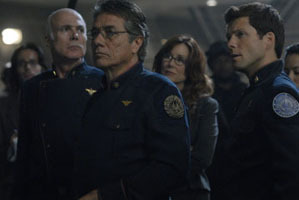 Battlestar Galactica: Razor was an oasis for BSG fans--when the double-length episode aired in November 2007, it was the only new material broadcast during the 12-month gap between seasons 3 and 4. 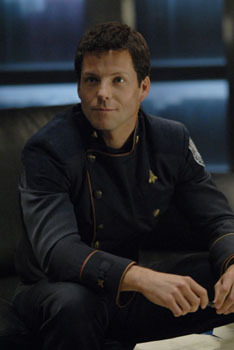 But although it sets up some events in season 4, chronologically Razor is a prequel taking place within season 2, when Galactica had unexpectedly met up with a fellow Battlestar, Pegasus. 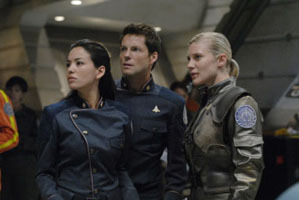 The central character is new, Kendra Shaw (Stephanie Jacobsen), who becomes the XO after Lee Adama (Jamie Bamber) takes command of the Pegasus. 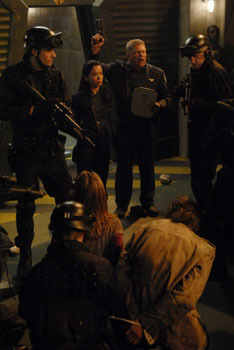 Shaw's promotion is controversial among Starbuck (Katee Sackhoff) and others because Shaw learned the trade under the previous commander of the Pegasus, Admiral Cain (Michelle Forbes), who lived by her own wartime rules. 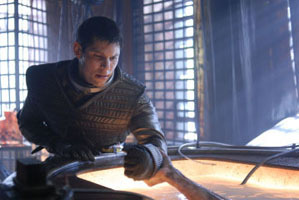 The central conflict in Razor involves the Pegasus trying to rescue a Raptor crew from the Cylons. During the mission Shaw flashes back to 10 months earlier, and her experiences in the immediate aftermath of the Cylons' wipeout of Caprica influence how she handles this mission and its implications of a new Cylon-human hybrid. Razor is a riveting adventure, full of the top writing, great acting, and dark end-of-humanity vision that makes Battlestar Galactica the best show on television (that is, when it's actually on). Fans will also enjoy the appearance of old-school Cylons, and the revelation that Gaius is not the only one who fell for the wiles of Number 6 (Tricia Helfer).